Aubin Stewart is an award winning independent jewellery designer and creative practitioner based in Aberdeen, Scotland. Practising from her studio workshop in Aberdeen, she creates contemporary jewellery collections which are sold via curated exhibitions, events and a range of stockists throughout the UK. Aubin began her career working as a designer, buyer and manager for almost 15 years in the jewellery trade before establishing her own independent brand, Aubeebop Jewellery, in 2008. 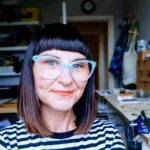 She has played an active role in the North East creative sector through the Sustaining Life as a Creative Programme, North East Open Studios, and is a member of the creative collective Look Inside. She is now an experienced educator and mentor, having worked on the delivery of a variety of workshops and projects with Grays School of Art, The Barn Arts and Aberdeen City Council.